Don't let this orange cat's outward cuteness fool you. He's a fierce little predator. His prey? Fingers. Our sweet domestic feline companions may seem a far cry from their big cat counterparts in the wild, but every kitty longs for something to come along and unlock their inner tiger. 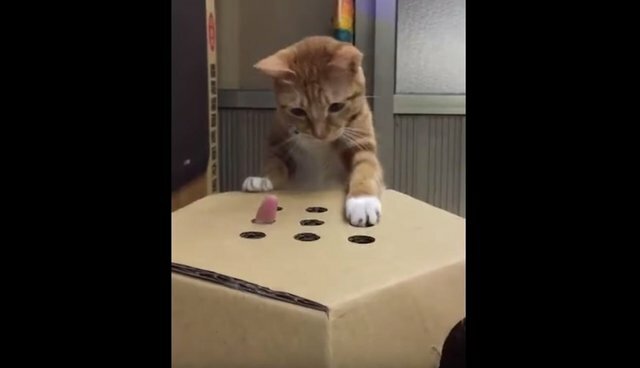 One genius pet owner found an awesome way to do just that - with this clever "whack-a-finger" game. Despite the fact that cats' favorite pastimes appear to be lounging around and napping, deep down they're longing for more. Enrichment activities, like the one seen above, are great ways to make shy cats more social, and to simply brighten their days. For more enrichment ideas, visit the ASPCA's website here.